Track your map runs in Path of Exile, and those of the whole community. The main goal of Path of Maps is to let you track your map runs in Path of Exile, and see stats about them. The Path of Maps desktop app allows you to control when a map starts or ends, to keep track of the valuable drops, etc, just by pressing a few hotkeys. Here's what you need to do to get things going. Get the PoM desktop app on Bitbucket, install it and run it. Register on Path of Maps to get your personal authentication token (you can find it on your settings page). Enter the token in the desktop app, in the settings window. Launch Path of Exile and the desktop app, and start tracking your map runs. You can set up hotkeys in the Settings window to start and end a map, record a drop etc. 1. Roll a map, then hover over it and press ctrl + s. This will send a text representation of the map to Path of maps, which will record it and display it in your profile. 2. After having started a map, you can record drops (maps, uniques, gems etc). To do so, just hover over the item, then press ctrl + d (or whatever you set in your settings). 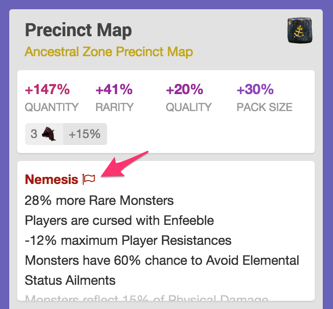 Then item should then appear on the map. 3. Finally, when you're done with your run, end the map with ctrl + e, for example. Some commands are not supported by the app UI, and you have to type commands in chat to interact with Path of Maps. After signing up, go to your settings page to find your authentication token. This token has to be entered in the desktop app. It allows the server to identify you when the desktop app is sending commands. I might implement OAuth later on, but for now, this will work. You should not share this token publicly. If it gets compromised, it's easy to generate a new token from your settings page. Some commands, like editing a map, are not supported in the UI, you'll have to enter them in the game chat. Click on a command to learn more about it and its options. When sending the > start command without options, the desktop app will look at the content of your clipboard and send it to the server, if it contains map data, and only then. So, to sum up, roll your map, then copy it by hovering over it in your inventory and pressing ctrl + c, and type > start in the chat window. That's the easiest method by far, so use it when possible! What about Zana dailies/missions? Those can't be copied. And what if you forgot to copy the map before opening it? Well, you can start a map manually by providing options to the start command. An option takes the following form: <option_name> <option value>. Note that the order in which you enter them doesn't matter. name sets the map name. ir sets the item rarity. iq sets the item quantity. ps sets the monster pack size. level (or lvl) and tier (or t) set the item level and map tier respectively. Setting one will set the other automatically. The rarity value can be one of the following: normal, magic, rare, and unique. craft <league_name> adds a "league mod" to your map, from Zana's crafting bench. You can shorten the league name and just use the first 3 characters, >s craft nem. The edit command allows you to edit the most recent map that's still opened. It takes the same options as the start command. To do so, hover over the item, then press ctrl + d (or whatever you set in your app settings). The copied item will be sent to pathofmaps.com and recorded as a drop of the current map. You can also use the > drop command without any arguments, but it's not recommended. 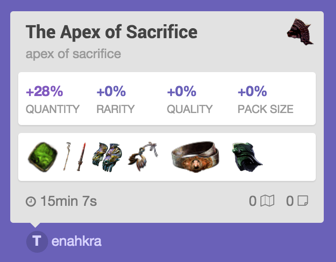 The supported items are: maps, unique items (any type), divination cards, currencies, fragments, gems and talismans. Note that uniques should be identified, otherwise it would be hard to determine which unique it is. This command is outdated and not recommended. The drop command allows you to record which map dropped during your run. You can list as many levels or tiers as you want in one command. Most people don't use this command as it just records the map tier, and use the more generic way of recording drops (see previous section). The note commands allows you to add notes to your map, to remember noteworthy events (exa drop, HC death, whatever). Log your encounters with masters with this command. You can either enter the full name, of the first 2 letters: > m za or > m el (for Elreon) would work too. The supported masters are: haku (ha), elreon (el), catarina (ca), tora (to), vorici (vo), leo (le), vagan (va), and zana (za). Use this command when you level up in a map. It's useful to get an idea of how many maps you had to run to get to this point. > ding 87. You can also use > lvlup 87. Ends the most recent map. Aborts the most recent map, in case you opened it by mistake, for instance. You can also simply delete it from the website, using the icon in the bottom right hand corner of the map. This command will reopen the last map, if it's closed. Useful if you closed it too soon and forgot to add some drops. This allows you to pause and resume the timer, if you need to stop for trading, or IRL stuff. To pause the timer, use > afk, or > afk on if you like complicating things. To resume the timer, use > afk off. The timer will only update itself on the site when you pause the map, or close it. Use this command to indicate how many fragments you placed in the map device, along with your map. The map quantity displayed will include this +15% IIQ bonus. You can also specify the fragment count in the start or edit command, along with other options. Adds a "league mod" to your map, from Zana's crafting bench. You can shorten the league name and just use the first 3 characters, > craft nem. The supported leagues can be found in the Wiki. Adding a league mod is also supported by the > start and > edit commands. Ex: > edit iiq 128 nemesis. The > rip command allows you to track when you die in a map. It can be used in different ways. > rip 2 will set the rip counter to 2, regardless of what it was before. It can be useful if you just want to set it once at the end of a map. > rip +2 will increment the counter by 2. You already could use > start name the apex of sacrifice to track an Atziri run, but it's long to type, and you'd get the hand icon on your map, which is usually there to indicate a map was started manually. > atziri is easier. To record an Uber run, > uber or > uber atziri would work. 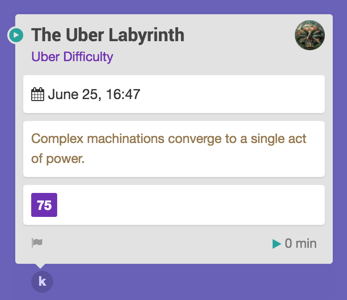 This command allows you to track The Lord's Labyrinth runs. There are 4 difficulties in which the lab can be run: normal, cruel, merciless and uber. For instance, you can track your Uber lab run with > lab uber. For every difficulty, you can also provide just the beginning of the difficulty name. Ex: > lab crwould also track your Cruel Lab run just fine. 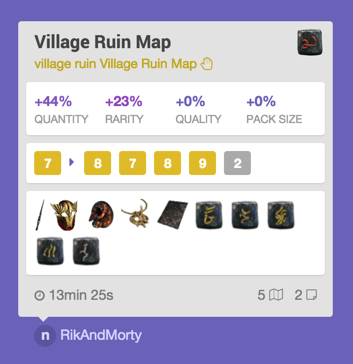 You can track the same type of items you would in maps, but you can also track Treasure keys, Silver/Gold keys and Trinkets (like Cogs of Disruption for instance).